CAPS Peer Educator Emma Burke shares her experience of navigating a relationship during the transition to college. Read on to see what she has to say! With everything we hear from our favorite TV shows, movies, and even music, it’s easy to begin thinking that by the time we get to college, we need to be in a serious relationship. College is where everyone finds their partner, right? Well, maybe not so right. According to The Daily Dot, only twenty-eight percent of married college graduates actually met their spouses during college while attending the same University (Klee). What does this tell us? College is where we come to grow into well-rounded adults. Do we like surfing? Do we enjoy tofu or steak? Do we want to travel, and if so, where do we want to go? Each one of us has to answer these questions for ourselves, and we have limitless opportunities to do so! There is no reason why we can’t find our partner along the way, but there’s also no pressure to be on the hunt for our soulmate before we find out what we actually want in one. And the most important thing to keep in mind is that if we feel the pressure to find a partner, we may be more likely to “plug someone in” instead of finding someone we truly want in our lives. Overlooking someone’s faults in an attempt to fulfill one’s societal duties can lead to unhealthy relationships and unhappiness. The intrepid Hilaria Barajas often leads the charge in ideas and projects here at PEP, so we are long overdue in introducing her to the student body for which she serves! Meditation in bed before I sleep helps me deal with stress. I enjoy being completely alone and within myself for those few minutes of complete non-judgment and deep breathing. At first it was difficult to focus my thoughts inwards since my mind tends to wander all over the place. Stopping to address and thank my mind for working the way it does helped me feel comfortable in my own silence. I still get distracted sometimes, but practice helps! I am passionate about my communities and the future. I like to try new things that allow me to learn more about myself and my surroundings, whether that be through music, connecting with people or nature, eating, dancing, writing, etc. I am passionate about shaping my own future and in turn shaping the future of my communities. CAPS is here for YOU. It is centered around students and student mental health needs. College is stressful and It’s okay to ask for help. CAPS is completely confidential and free so if you’re even a little bit curious, try it out. Greetings Slugs! We hope you are all practicing self-care as we progress through the quarter. Today we are disclosing one CAPS Peer Educator’s personal tips to relieve stress (as well as a few other juicy details about her). One of the things I like to do that helps me relieve stress is to make a “To Do” list. At the beginning of the week I put everything I need to do on a list and leave it on my desk so that I can check things off as I go. It’s a really satisfying feeling when I get to cross off a task or an assignment, and it helps me feel like I am in control and keeps me from getting too overwhelmed. In my free time it’s pretty difficult to get me out of the water. I love swimming, being in the ocean, and playing water polo. I play water polo for the club team here at UCSC and it’s been a great way for me to get to play the sport I love, make new friends, and relieve stress. Aside from water polo, I am also really passionate about helping people understand the idea that mental health is just as important as physical health. I am so excited to be a Peer Educator because I want to spread the word that mental health is important and if you ever need help maintaining it, it is nothing to be ashamed of. I want everyone to know that CAPS is here ready to welcome you with open arms. When your ankle swells up and you can’t walk, do you go see a doctor? Well, when you need someone to talk to, CAPS is also here. It’s as simple as that. Emma Burke is a second year Psychology and Literature double major affiliated with Merrill. Hey Slugs! We hope you enjoy this article from one of our Peer Educators, Miriam Medina, about finding a balance with time management. Enjoy, and keep checking back for more articles by our great PEP Team! Is it me or is this quarter going by ridiculously fast? It seems as though we have tons of assignments and tasks that are piling up before us with very little time to complete each one. What does our situation call for? Time management. We have heard about it thousands of times from our advisors, professors, and even friends. The actual act of managing your time consists of thinking out all your responsibilities and activities and distributing them thoughtfully throughout your days of the week; in order, to ensure that they are completed efficiently. Such activities will probably include going to classes, doing homework, working, or even doing exercise. But as you have already probably figured out, the actual act of managing your time is way easier said and talked about than done. So how can we make it easier for it to be actually be “done”? Hello fellow Slugs! Today we’d like to introduce another amazing PEP member, Aditi. We’re so glad to have her on the team this year. Thanks for all you do, Aditi! When I get stressed I like to decompress. When I’m really stressed, my feelings and emotions tend to build to the point where I have to create environments for myself that are less stimulating. The ways that I do that are unplugging, reading a good book or watching a good tv show. I recently learned of a new type of deep breathing exercise through the CAPS Stress Less presentation and started incorporating it into my routine. It works really well. I’m passionate about a lot of things! I love children and I enjoy working with them on their academics and overall well being. I like keeping active and I enjoy such sports as tennis and baseball. I recently started kickboxing and it’s a lot of fun. I also like curling up with a good book and keeping my finger of the pulse of pop culture, watching TV and movies. If I could tell my peers anything about CAPS, I would say that CAPS services are confidential, and genuinely there to help you, no matter what you think the size or the scope of the problem is. 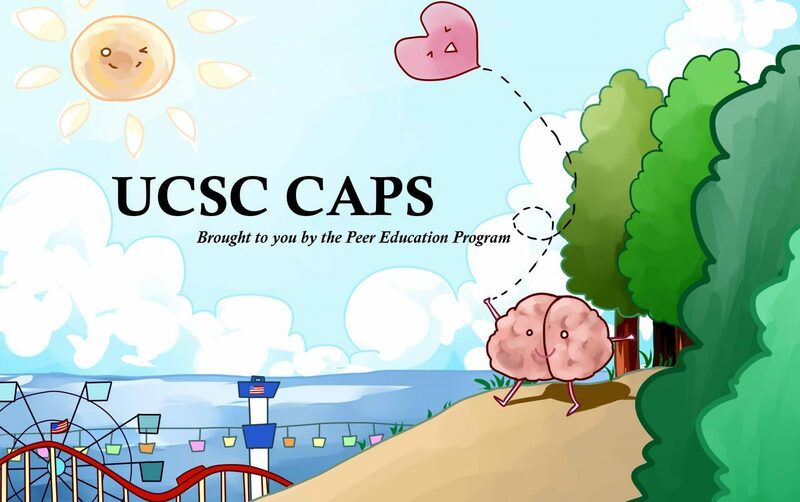 CAPS works on a day to day basis to help students deal with their individual stresses, but beyond this, they work hard reduce the stigma associated with seeking mental health services. They consider both the battle and the war. And that’s really important. Aditi is a second year Intensive Psychology major, affiliated with Crown. Hi all! Thanks for checking back with the blog. Today we’d like to introduce one of our Peer Educators, Samer. He’s been working hard this year and we appreciate all that he does for CAPS and PEP! To relieve stress, I like to hang out and have a good time with my friends, listening to music, or even watching TV with them. It always relaxes me and puts me into a better mind state. I am pretty passionate about astrophysics and neuroscience. I often find myself looking at articles, taking online courses, and learning new things about both subjects. I also love the environment, and will do what I can to increase awareness and sustainability wherever I can. If I were to share one thing about CAPS, it is that they have so many resources that a lot of people just do not know about! Everyone should really go on their page online and check them out, they are very helpful and free!! Samer is a second year Neuroscience major, and he is affiliated with Kresge. Hello! One of our great Peer Educators, Melissa Newton, shares an article about how to approach loneliness, especially during Winter Quarter. Enjoy! Winter quarter, in my experience, is by far the loneliest quarter. If people have to bundle up to go outside, they tend to avoid it compared to warmer months. The sun’s early descent in winter can make the low temperatures and feelings of isolation from others feel even worse. I am an introvert, and so I rather like to re-energize in the solitude of my heated blanket, but this can make it extremely difficult to make any effort to see people. When this becomes a pattern for too long, I feel lonely, isolated, and depressed—even for the whole quarter! Often, this makes me cycle into feeling unmotivated to do schoolwork, causing more stress in my life along with even more sadness, and I may even spend a good chunk of time crying or thinking that my friends do not want to hang out with me. Contrary to what movies may show about college life, this is common. Feeling lonely when surrounded by hundreds of peers of the same age sounds ridiculous, but it is far from unusual. So, what can students do to get through this winter quarter funk?